There are days when I am not in the mood for traditional dinner fare and so fill the gap with strata, frittatas, pancakes and French toast. Why not eat one of these delicious things in the evening? Greg and I prefer stratas, omelets or fritattas, rather than the pancakes the kids beg for. Add a green salad and the meal is complete. I am most apt to serve breakfast for dinner on those hectic nights when sports schedules, after-school activities, and late meetings make planning a more typical meal tricky. Guess what? No one objects! A strata as rich and full flavored as this earns its stripes on the dinner table when paired with a crisp arugula or frisee salad and a glass of wine. I especially like it in the fall and winter when pears are in the markets. If you don’t like goat cheese, substitute mozzarella; if you don’t have proscuitto, use ham. This can be assembled early in the day and popped in the oven when you get home. Serve the leftovers the next morning for breakfast, and if you’re looking for something to make for brunch, look no further. Lightly spray a 13-by-9-by-2-inch baking dish with flavorless vegetable spray. Cut the bread into 1-inch cubes and spread nearly half over the bottom of the pan. Reserve the remaining bread cubes. In a medium sauté pan, heat the butter over medium heat and when it melts and bubbles, add the pears and sauté for 5 to 6 minutes or until they soften and begin to caramelize. Remove from the heat and set aside. In a mixing bowl, beat together the eggs, milk, mustard, thyme, and salt. Season with pepper. Spread half of the prosciutto, half the cheese, and half the pears over the bread. Spread the remaining bread cubes over these ingredients and then top evenly with the remaining prosciutto, cheese, and pears. Pour the egg mixture over the strata and press lightly on the bread to submerge it in the liquid so that it soaks evenly. Cover with plastic wrap and refrigerate for at least 6 hours and up to 12 hours or overnight. 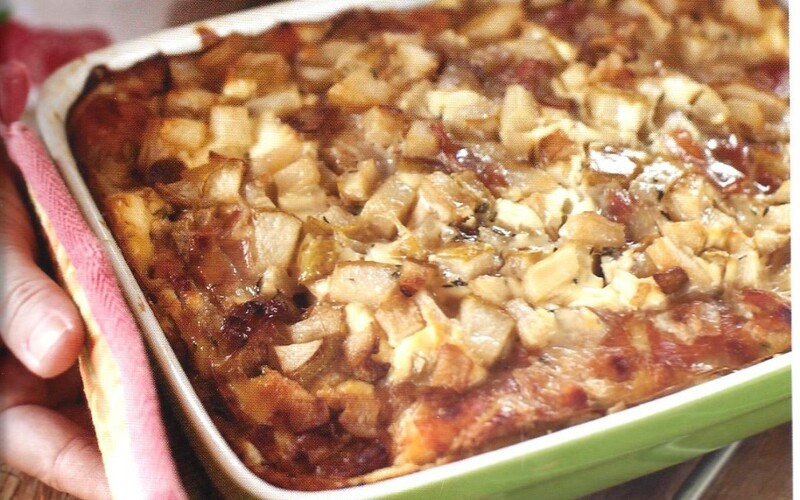 Take the strata from the refrigerator 30 minutes before baking. Preheat the oven to 350°F. Remove the plastic wrap and bake the strata for 45 to 50 minutes or until the center is set and no longer wobbly. Serve warm.